As creative souls, we love the opportunity to sit down with our customers and give input on design ideas of your various projects. Whether it is a home renovation using salvaged materials, a specific custom creation, such as a table or door, the use of salvaged materials in restaurant decor or stage design, we enjoy being involved in the design process. While we would love to be able to sit down and spend one-on-one time with every customer, during our regular business hours, it is just not always possible. However, while Southern Accents showroom is closed to the public on Sundays and Mondays, we are available on Mondays for this creative process by appointment! If you’ve ever lived in a small town, you already know regular business hours are typically a little “different!” For Cullman, Alabama, that means that most businesses downtown, even a lot of the local restaurants, are closed on Mondays. Since most of the downtown businesses open on Saturday, Sunday and Monday are needed to allow owners and employees an opportunity to rest so that we can continue to work hard throughout the week. Most weeks, however, we will have a few out-of-town customers not familiar with this small town practice, travel to Cullman, only to be disappointed that we are closed. Even though our showroom is closed on Mondays, you can call ahead and book an appointment for a one-on-one consultation with Southern Accents owner, Garlan Gudger or sales team member Ben Sellers. Those seeking an appointment are asked to call at least one to two weeks in advance to inquire on appointment availability. Making a Monday appointment allows us the opportunity to focus our full attention on your project without the distractions of the day to day business during the rest of the week. Once you’ve booked an appointment we encourage you to come prepared! Some of the things you will want to bring with you for your appointment include blueprints, exact measurements, sketches, and design ideas. If you have pictures of what you want your project to look like, print them off or have them organized on a Pinterest board that we can look at. If your project involves using salvaged materials for home, office or restaurant decor or possibly a stage design, have a sketch and measurements of the room or stage layout. The better prepared you are, the more progress we can make during your appointment. During your appointment, you will be able to sit down with Garlan or Ben and discuss your project. 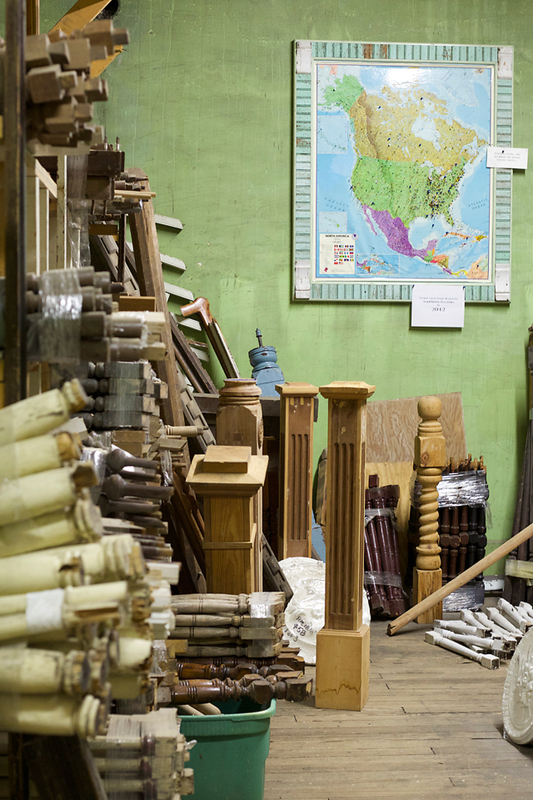 If you are ready to look at materials, you will be able browse our selection of architectural antiques and salvaged goods in our showroom as well as our warehouses. If you are ready to make a purchase, you will also have the opportunity to purchase materials that day so come prepared to haul your wares home! Ready for some one-on-one time? Call our showroom at 877 737-0554 during our regular business hours of Tuesday – Friday 9am to 5pm and Saturday 10am to 4pm. Makenzie will take your request and contact information and then get back with you to schedule your appointment! We look forward to working with you on your next project! We were SO excited about an event that took place this past Saturday in Huntsville, Alabama. 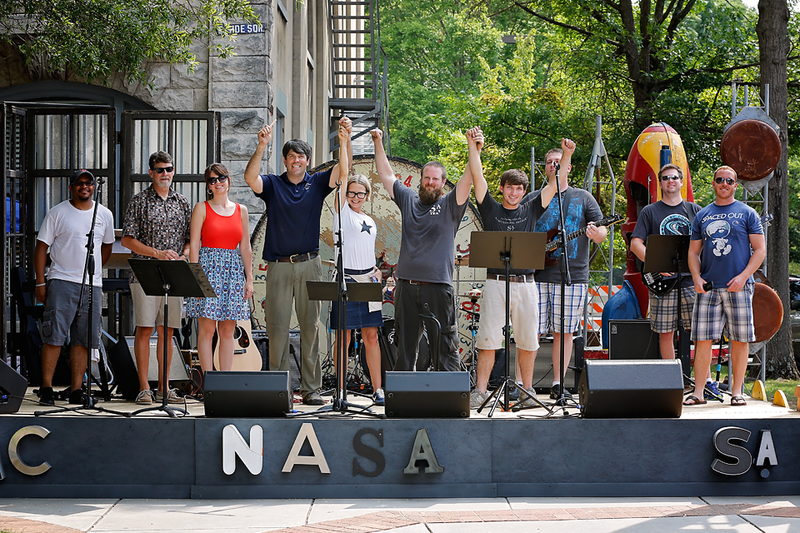 Southern Accents created a one-of-a-kind stage design for “NASA on the Square!” Downtown Huntsville, Inc. partnered with Marshall Space Flight Center for an event that celebrated the amazing past, present and future programs and missions of NASA. 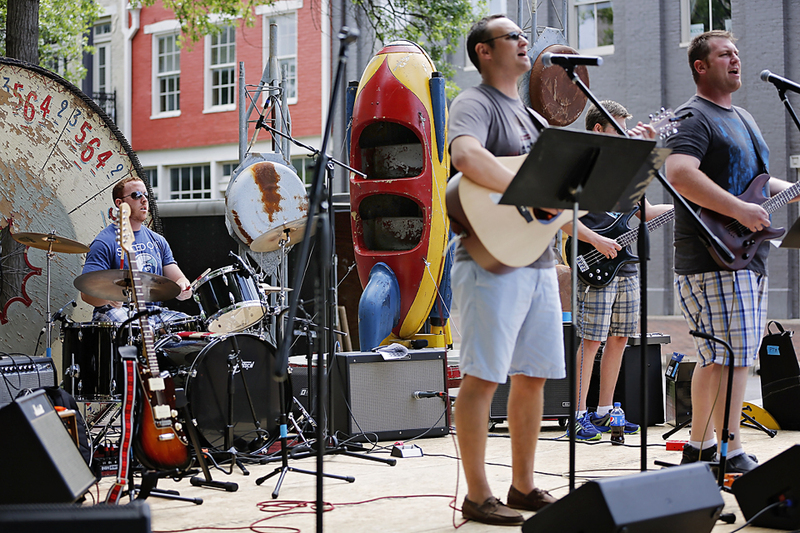 This event took place on the Square in Downtown Huntsville on Saturday, June 21st, from 11:00 am till 4:00 pm. 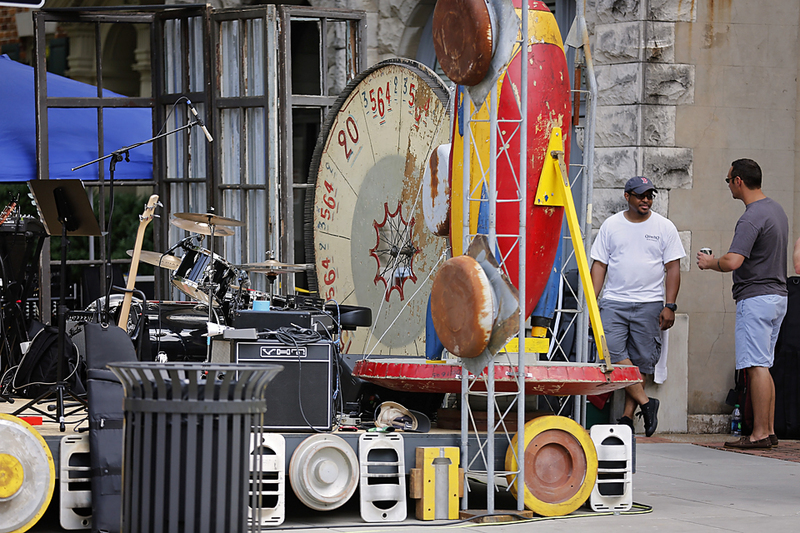 The festivities, designed for all ages, included live music, food, free activities, chats with astronauts, and more. 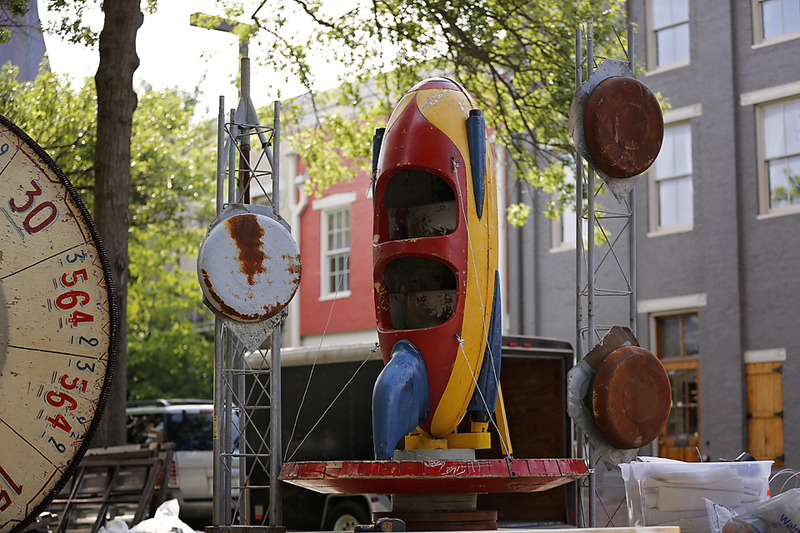 The Tintin rocket was the inspiration for the stage setup at “NASA on the Square” in Huntsville, Alabama. When sketching out design ideas for the stage, the obvious theme was a rocket. 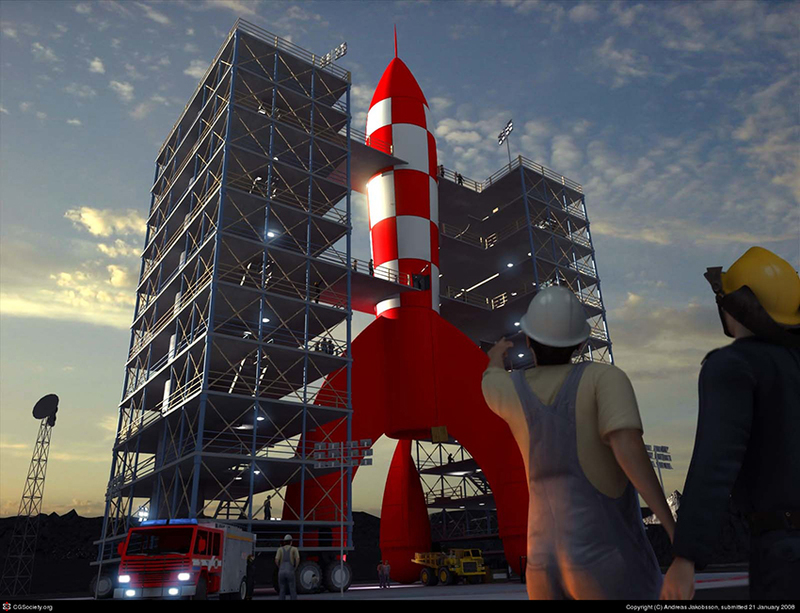 Andrea Jean of GMC was inspired by the Tintin rocket from the comic book series. 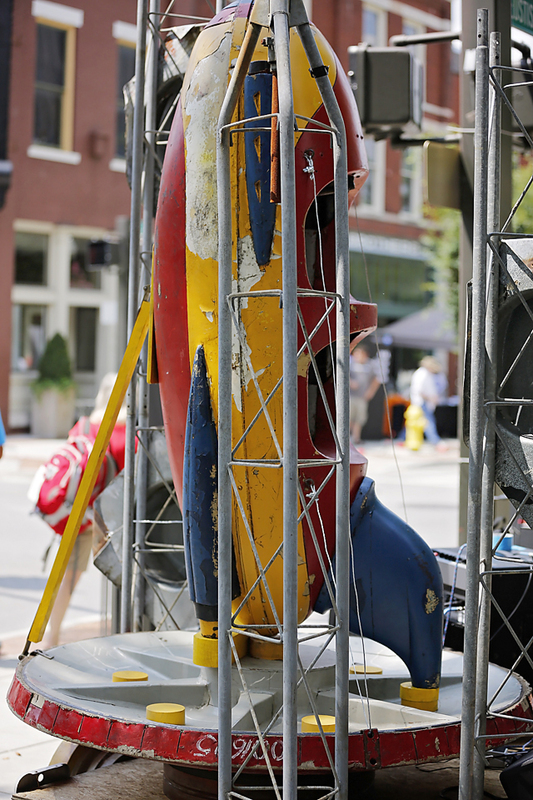 Playing off of that idea, we incorporated a salvaged carnival ride rocket in our set design! Huntsville has been home to the Marshall Center for more than 50 years! As always, we are proud of our Alabama connection and honored to have participated in this celebration. 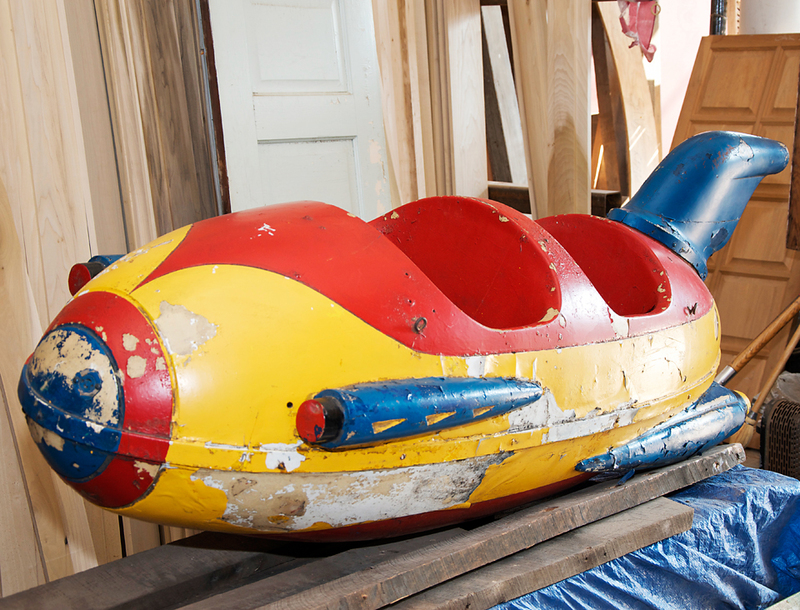 This salvaged carnival rocket will be incorporated into the stage design. Thanks to the Tanner House in Nolensville, Tennessee for finding this great prop! Southern Accents team members worked hard all week constructing this unique set. The stage was located on the east side of the square. After arriving Saturday morning we had to tweak the set up just a bit to accommodate the band equipment but in the end we think the finished stage resulted in the coolest corner on the square! 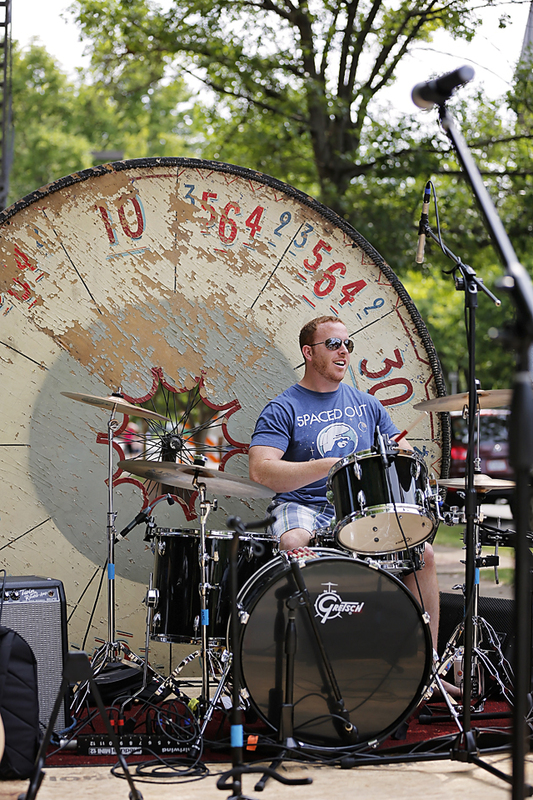 The antique carnival rocket was perfect for this stage setup! It definitely received a lot of attention throughout the day. This backdrop to the left side of the stage was created with salvaged windows backed with old corrugated tin, mimicking the look of the steel test stands that are currently under construction at Marshall Space Flight Center. 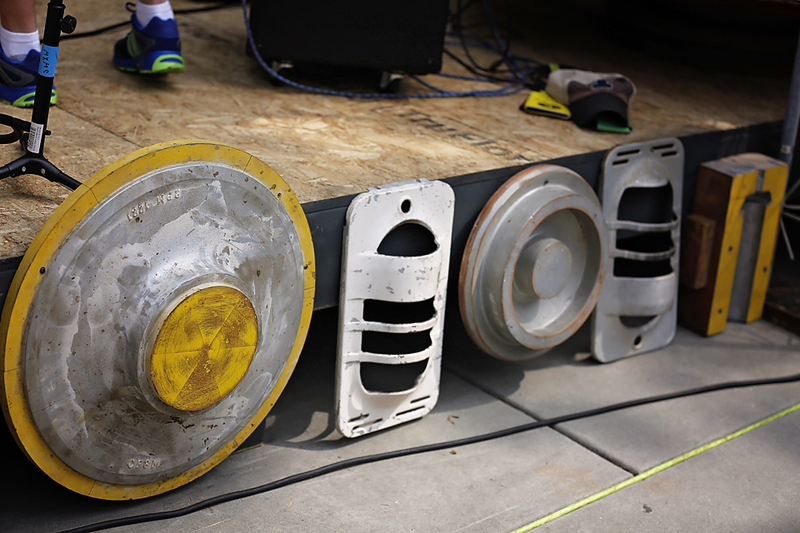 We used salvaged industrial molds and gas heater masks to create interest along the stage side. 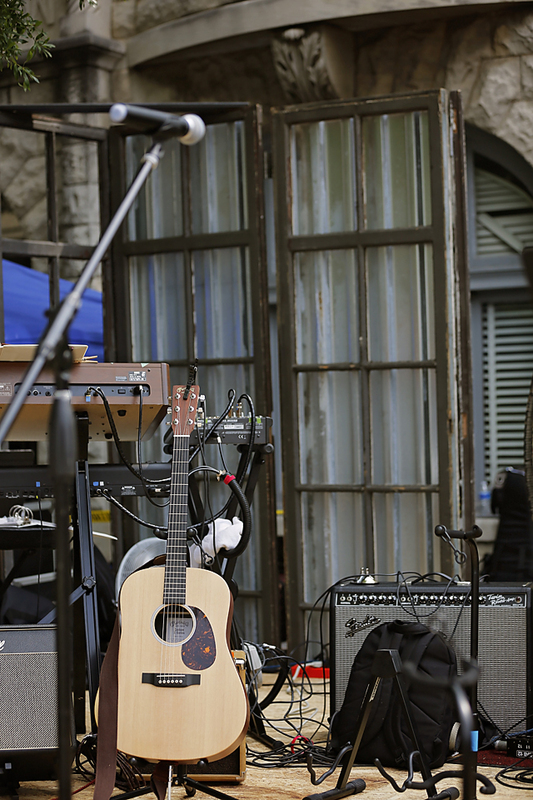 Four bands took the stage throughout the day to entertain the crowd! Thanks to the SA team for all their hard work in turning this vision into reality! Also thanks to Andrea Jean from GMC who is always a pleasure to work with! Southern Accents is a great resource for event planners and coordinaters who are looking for something different and unique. If you have an upcoming event that requires the construction of an entrance or stage, please come talk to us and let us show you how we can help. If you live within driving distance of our showroom and are simply looking for props for an upcoming wedding or event, we can help out there as well! We have a great selection of architectural pieces available for rent! 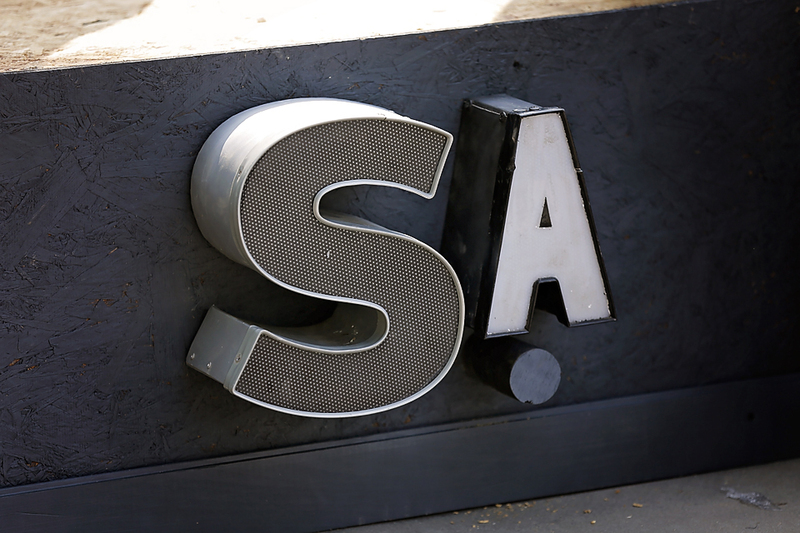 You can reach us toll free at 877 737-0554 or by email at: info@sa1969.com. What is it about a stack of salvaged barn wood that would warrant a husband choosing it as an anniversary gift for his wife? We were elated to read a story this week from one of our customers, Stephen Smith. Stephen and his wife Michele traveled from Bohannon Ford, Alabama to Cullman this past Saturday with a specific goal in mind: a visit to Southern Accents wood warehouse! Celebrating their 26th anniversary, instead of jewelry, Michele asked for wood… not just any wood, but specifically old barn wood with loads of character! The Smith’s had spent years trying to decide what to do with a 9 foot wide accent wall in their kitchen. Having made the decision to cover the wall with old wood, they embarked on a mission to find the perfect covering. 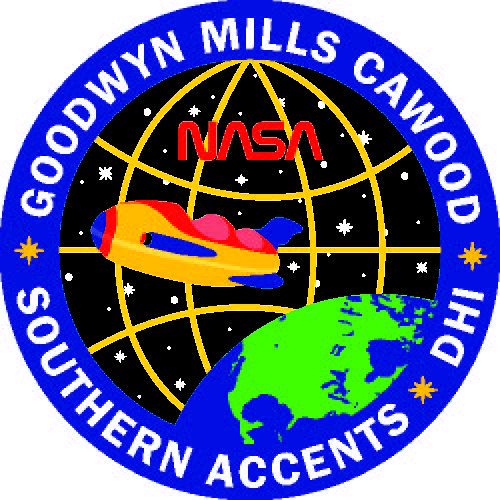 Their trip to Southern Accents could not have been timed any better! Upon arriving at our wood warehouse they immediately spotted a stack of gray barn wood with a hint of white paint still hanging on to the boards. They shared their project plans with SA team member Justin who showed them several available wood options, but they kept going back to that first stack. As it turns out, that stack of barn wood had just been unloaded. Stephen and Michele were also fortunate enough to be able to gather a little history on the 112 year old wood from the man who salvaged it! The salvaged wood chosen for the Smith’s kitchen wall project came from a 1902 barn that a few days prior had stood on a farm in Ada, Ohio. As Stephen began measuring and cutting the lap board siding for his wall, he discovered writing on the back of one of the boards. 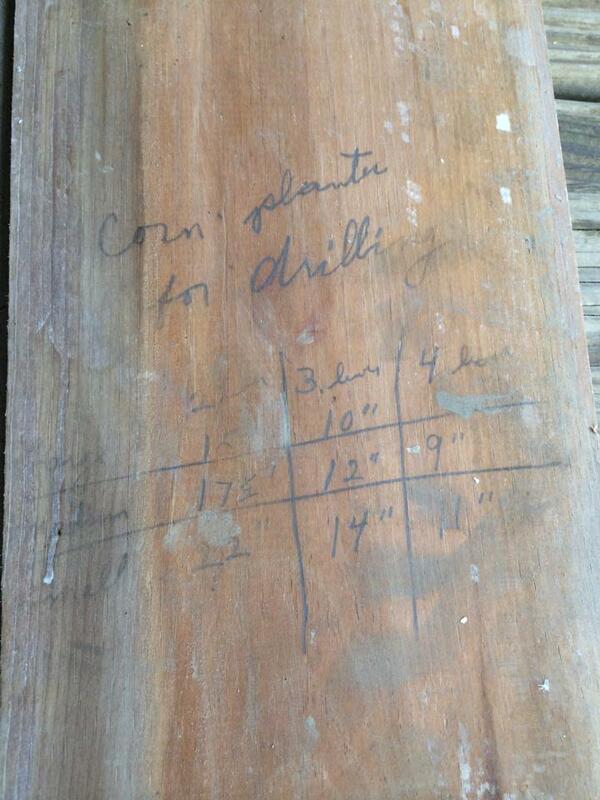 The penciled marks read “corn planter for drilling” along with a planting chart. Were these notes written over 100 years ago by the barns original owner or are the scribblings more recent? Either way, it is a clear note from a hard working farmer who surely treasured his barn. The discovery of this marking only added character to this prized stack of wood. 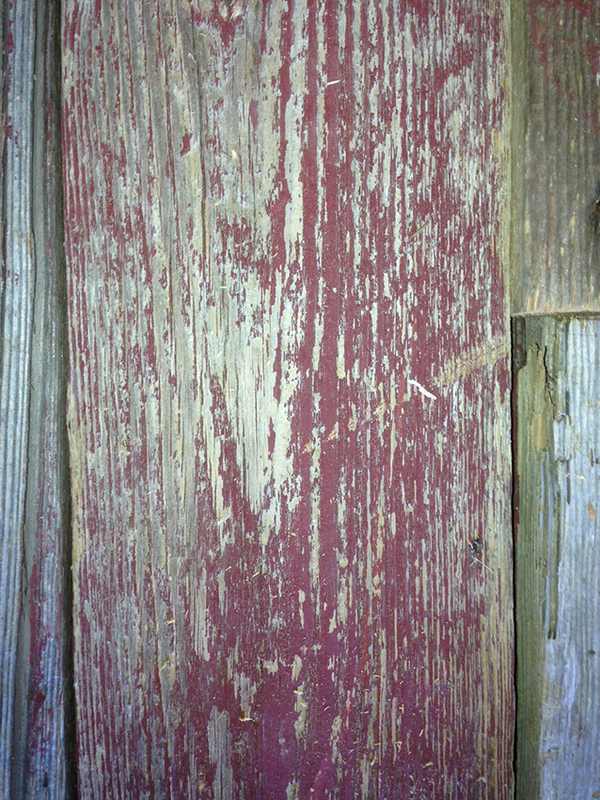 The markings on this piece of siding from the 1902 barn only adds character. Project complete, Stephen and Michele’s kitchen wall looks fabulous! We thank them for sharing their story and pictures. If you visit Southern Accents on Facebook, look for Stephen’s full story posted on our timeline. 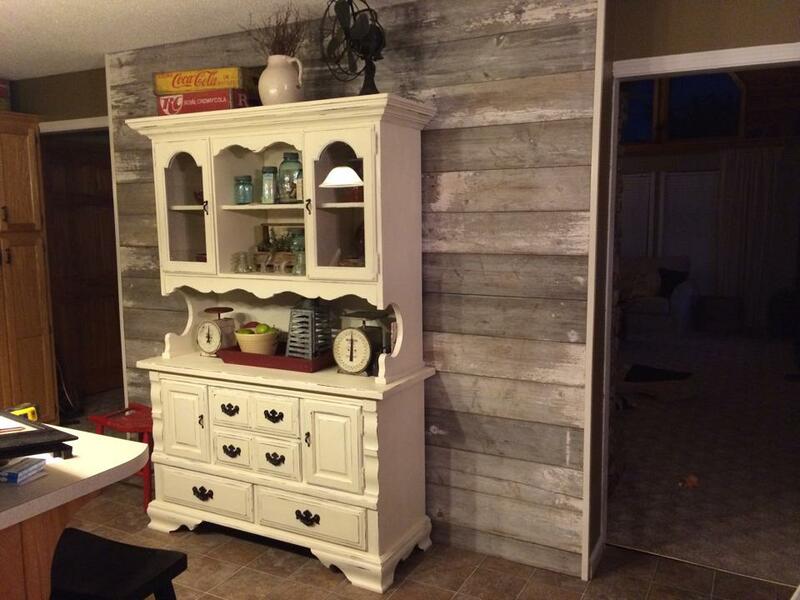 The Smith’s finished barn wood kitchen wall looks fabulous! We invite you to visit our wood warehouse and let us show you our incredible selection of salvaged wood. One of our knowledgable team members can help you pick out the perfect stack for your next project! Our wood warehouse is open Tuesday – Friday from 9 am till 5 pm and Saturday from 10 am till 4 pm. When you visit our showroom, our collection of architectural antiques is quite impressive. But look beyond the doors, mantels, columns, tubs, etc. and you will see beautiful brick walls, old fire doors and creaky old wood floors. 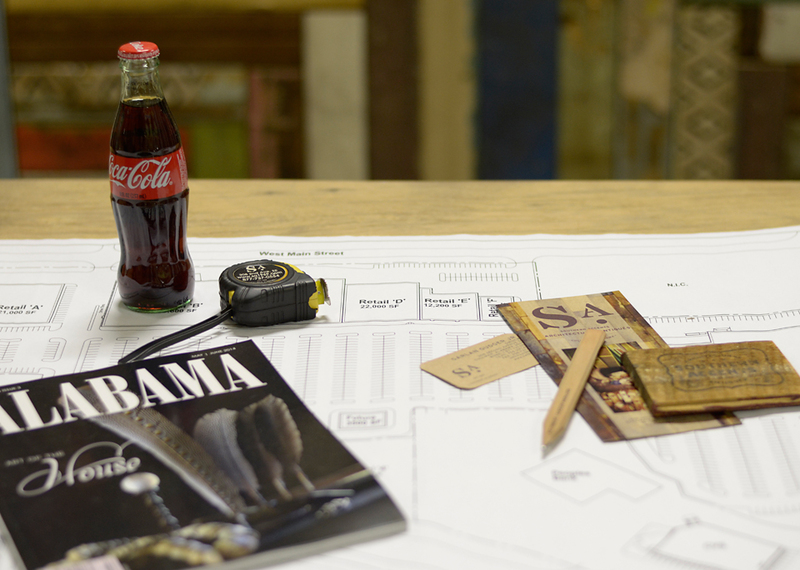 The Southern Accents showroom is rich with history and warrants a visit to Cullman, Alabama all on its own! Cullman was founded in 1873 by Colonel John G. Cullmann, a German refugee who’s dream was to develop a thriving German immigrant colony in the South. Colonel Cullmann’s recruiting efforts were successful and by 1877, the settlement had grown enough to meet the population requirement needed for the creation of a new county. 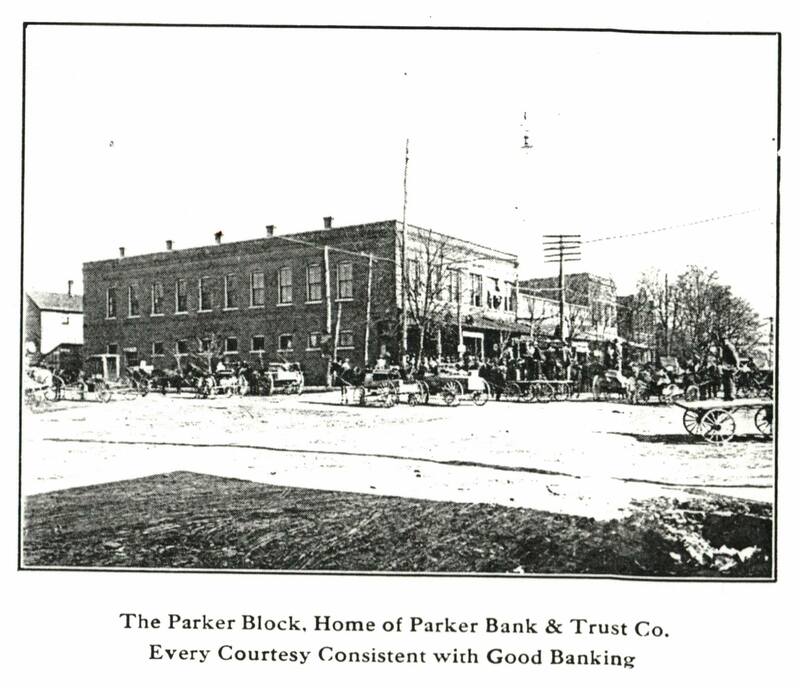 In 1884, one of the first banks in Cullman was established, Parker Bank & Trust Company. 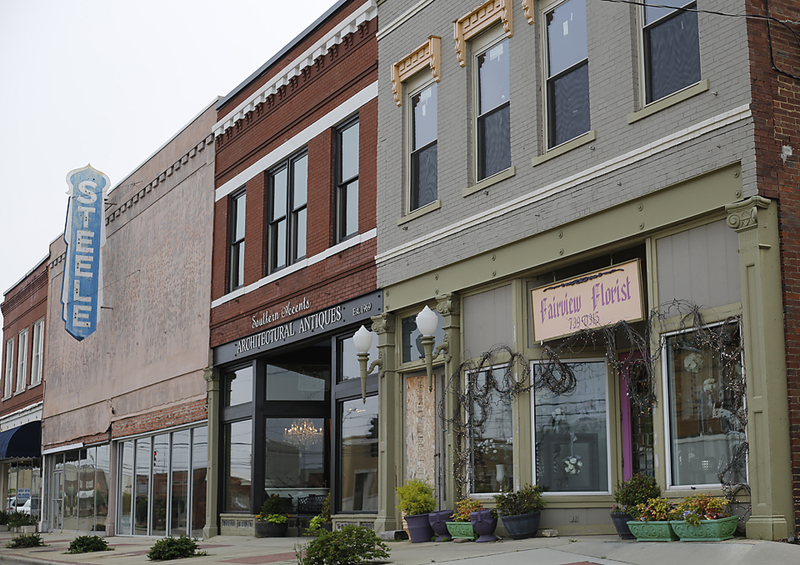 The Cullman community was growing at a rapid rate and there was a need for housing. By 1910 Parker Bank had built two adjoining buildings next door as an investment property to help meet that need. Initially, one of the buildings that now houses Southern Accents showroom, served as a hotel providing temporary shelter for new immigrants moving to the area. Years later the hotel was turned into a girls boarding school and dormitory. Eventually the building returned to housing families upstairs while the downstairs was rented to retail shop owners. Over time, the bank continued to add to this building. Today, this building which faces 2nd Ave SE, houses four retail businesses, including Southern Accents. The old Parker Bank building is still standing next door and is currently under renovation. This building, erected around 1910, as it stands today. Southern Accents showroom is the second storefront from the right. In the late 1970’s Dr. Garlan Gudger, Sr., looking to move his hobby turned architectural antique business to the downtown area, initially purchased the storefront closest to the Parker Bank building. Next door was a paint store owned by a Mr. Jay Cole. As Dr. Gudger’s inventory and customer base increased he saw the need for a larger retail space. Dr. Gudger purchased the larger storefront space from Mr. Cole in the early 80’s and moved his wares next door, where we can still be found today. 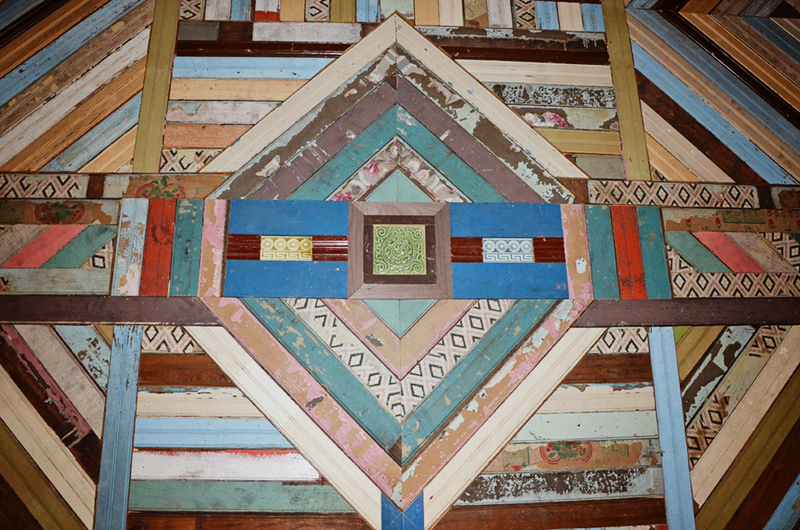 Southern Accents famous salvaged wood wall! In the years since moving to our current location, our showroom has undergone a few changes including the addition of a large stairway which further increased our retail space by allowing easy access to the second floor. In April of 2011 the building sustained damage from the F4 tornado that destroyed a good portion of Cullman’s downtown area. The damage was repaired and 2014 saw the addition of office space upstairs along with our salvaged wood wall that is already on the “must see” list when visiting us! Peek into our spindle room upstairs and take a look at our map hanging on the wall. This map is covered with pins showing where all our wonderful customers have come from! Our showroom is open Tues – Fri 9am to 5pm and Sat 10am to 4pm. Stop in for a visit and let one of our team members show you around! You can also watch this VIDEO for a brief tour of our showroom! 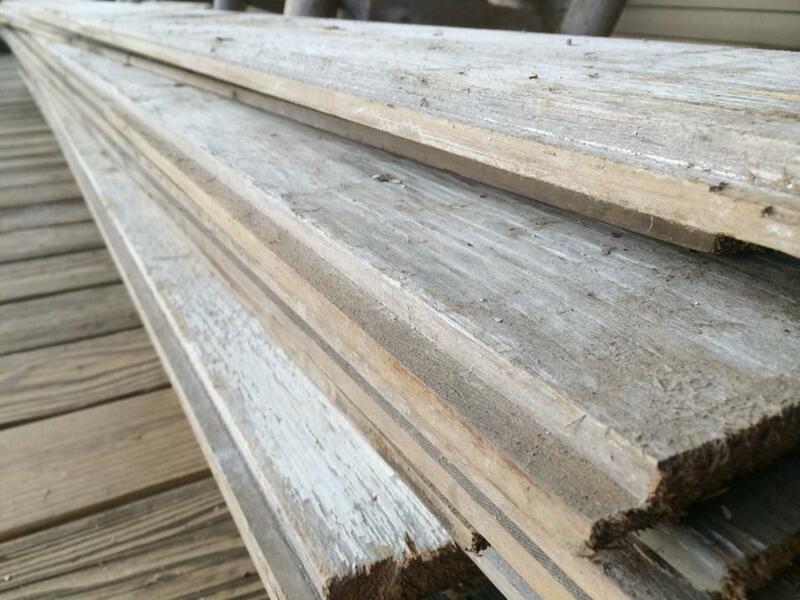 One of the most sought after items at Southern Accents wood warehouse is salvaged red barn wood. What is it about the old red painted wood that is so irresistible? For that matter… why are so many barns painted red? A little research uncovered quite a few very interesting facts as to why barns are painted that wonderful color of red! This picture of a beautiful red barn in Tennessee was taken by artist Mellissa Meeks. As research has it, some settlers in the early 1700’s left their barns unpainted because they simply could not afford the paint. By the late 1700’s farmers began to experiment with ways to make their own paint in an effort to protect the barn wood from the elements. Linseed oil, which has a dark coral hue, was often mixed with skim milk and lime which sealed the wood to help keep it from rotting. This mixture was inexpensive to make and lasted for years. The linseed oil mixture, however, did not address the issue of mold. Mold, in large quantities, posed a health risk for people as well as the animals. Growing on the barn, mold trapped moisture in the wood causing it to decay. Farmers began adding ferrous oxide (rusted iron) to the linseed oil mixture. Rust was plentiful and was a known poison to many molds and moss. The linseed oil and ferrous oxide were both responsible for the red color, but it was more of a burnt-orange red. Another theory, which has some credence dating back to the American Indians, states that some farmers added blood from a recent slaughter to the mixture which turned the paint to a darker red. Some believe that the darker red color was an effort to make the barn covering look more like brick from a distance, giving the appearance of affluence. 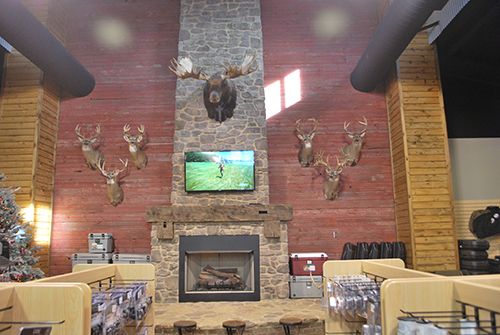 Salvaged red barn wood from Southern Accents was used to cover this wall at Grabow Outdoors in Fultondale, Alabama. There is also the belief that farmers chose red so that their cows could find their way home! Given the fact that cows are colorblind and can’t see red or green hues, that strategy failed! By the mid to late 1800’s as paints were being produced with chemical pigments, red was the least expensive paint color to purchase making it the continued color of choice. 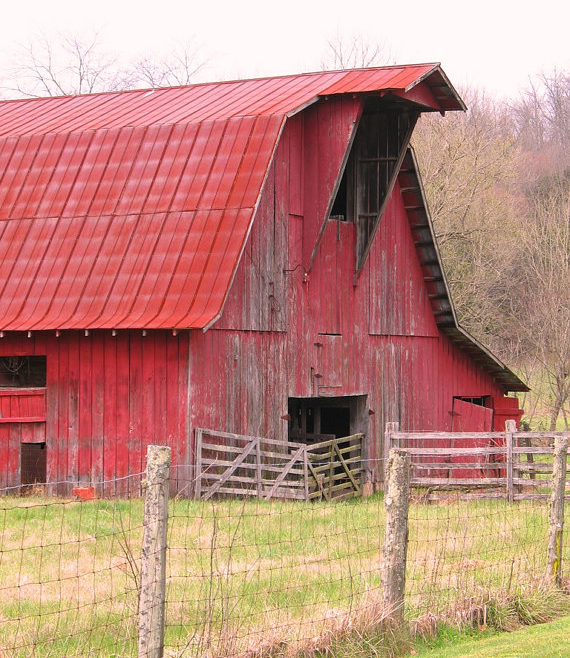 Today, many farmers paint the barn red in honor of tradition. After all, what is more picturesque than a beautiful red barn set against a backdrop of a green field or pasture?